Many people, not least members of our own congregation, are asked to name their favourite (most admired) person in history. For Rod, one of the foremost contenders for this accolade would be the Abbess Hildegard of Bingen. This formidable 12th Century Abbess was a polymath in her time, influencing religious thought and deeply involved in all academic disciplines. She was a poet and devotional writer and competent in all the arts and sciences including medicine and music. The Abbess corresponded with the Holy Roman Emperor, Frederick Barbarossa and communicated directly with the Pope. Throughout her life she experienced visions which subsequently were authenticated by the Pope - Eugenius III and the Archbishop of Mainz. These visions were recorded in her major literary work called Scivias in which 26 of her major religious experiences were described. She ordered, and supervised the making of a number of circular paintings, most notable of which is a beautiful design called ‘The Choirs of Angels’. These round designs are now called ‘Mandalas’ and are currently popular in their construction and display. The word is derived from Sanscrit, originally a spiritual and ritualist symbol describing the Universe. It has come now to be a generic term for any round diagram, pattern or design, which may, or not, have spiritual or religious meaning. The designs are likely to be symmetrical (translational, reflective or rotational) round the centre, and constructed at the discretion of the creator. Mandalas are made by religious and other groups throughout the world. In Tibet and in America (by the Native Americans) they are deliberately made from transitory materials and are ceremoniously destroyed soon after making. Many religious organisations, including Christian ones, use Mandalas as artistic expressions of their views of the world. 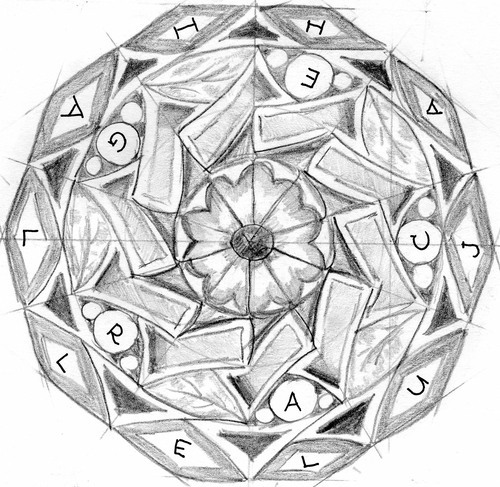 In a previous issue of this Church Magazine, Rod has designed a Mandala embedded with Christian symbols. One straightforward method of designing a Mandala has been devised by Rod. It consists of drawing a number of concentric circles round a core and then superimposing a regular geometric figure over them. The resultant shapes presented are extremely pleasing and lend themselves to colour, shading or other decoration. The result is often very beautiful and looks more complicated than it is. An expression of artistry for young and old.